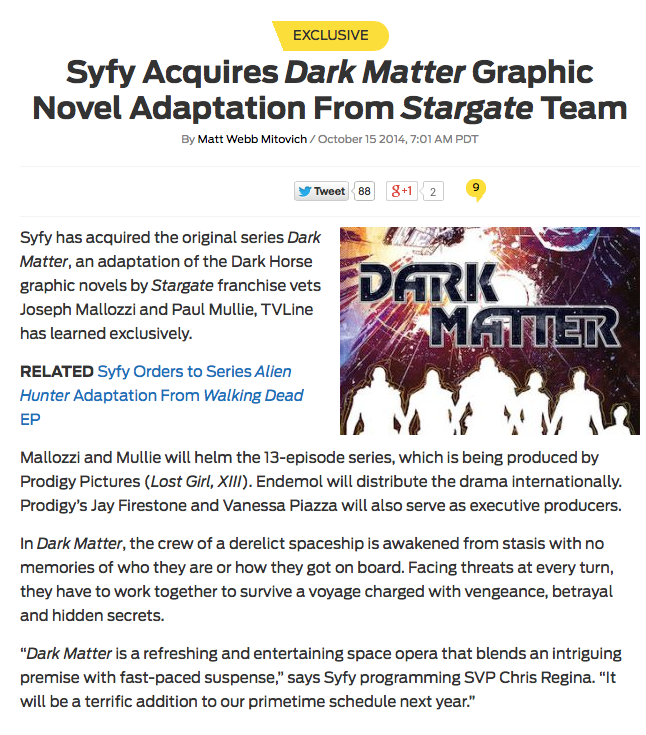 October 15, 2014: Dark Matter! Great news for all sci-fi fans everywhere. And you’ll see a lot of your old Stargate (crew at least) together again. So I DIDN’T imagine the whole thing. Unless, of course, this is also part of my elaborate, ongoing hallucination and those url’s actually link to the live cam of a cat hotel in Cornwall. First and foremost, Jay Firestone of Prodigy Pictures who worked tirelessly for months (and months and months!) relentlessly pursuing (I suspect he’s really a T-1000) and piecing together the various deals that made Dark Matter, the t.v. series, a reality. If not for all of Jay’s determined hard work, none of this would have been possible and I would have had to find something else to blog about today.